On Tuesday February 26, at approximately 8:06 am, Sergeant Sergio Teruel and Deputy Josh McGuinn responded to the 9500 block of River View Road in reference to an Assault. Upon arrival, the Reporting Person reported that he was assaulted by a subject while in the 200 block of Marin Luther King Blvd. On Wednesday February 27, at approximately 3:44 pm, Deputy Jason Vandygriff responded to the 3800 block of F.M. 368 South in reference to a Theft. Upon arrival, the Reporting Person reported that an unknown person(s) entered his property and stole a 2003 Honda Rancher ES ATV. On Thursday February 28, at approximately 1:06 am, Deputy Brett Brasher made a traffic stop at the intersection of Midwestern Pkwy. and Jacksboro Hwy. The 46-year-old male driver was placed under arrest. He was transported to the Wichita County Detention Center and was charged with Driving While Intoxicated. On Monday February 25, at approximately 1:22 am, Corporal Kristian Valdez and Deputy Aaron Perkins made a traffic stop on two vehicles at the intersection of Central Frwy. and Maurine. A 26-year-old male passenger and a 27-year-old male passenger in the first vehicle were placed under arrest. They were transported to the Wichita County Detention Center and were charged with Possession of a Controlled Substance PG 2 over four grams under 400 grams. A 30-year-old female passenger in the first vehicle was issued a citation for Possession of Drug Paraphernalia. The 25-year-old male driver and a 24-year-old male passenger in the second vehicle were placed under arrest. They were transported to the Wichita County Detention Center and charged with Possession of a Controlled Substance PG 2 over four grams under two hundred grams and issued citations for Possession of Drug Paraphernalia.. A 17-year-old male passenger and a 23-year-old female passenger in the second vehicle were issued citations for Possession of Drug Paraphernalia. On Monday February 25, at approximately 2:00 pm, a Wichita County Highway Interdiction Deputy made a traffic stop at the intersection of U.S. 287 and Burnett Ranch Road. The 44-year-old male driver was placed under arrest. He was transported to the Wichita County Detention Center and was charged with Possession of Marijuana over fifty pounds under two thousand pounds. On Tuesday February 26, at approximately 12:16 am, Deputy Roy Biter and Deputy Hunter McCain made a traffic stop at the intersection of Central Frwy and Iowa Park Road. The 27-year-old male driver was issued a citation for Possession of Drug Paraphernalia. On Friday February 22, at approximately 5:18 pm, a Wichita County Highway Interdiction Deputy made a traffic stop at the intersection of U.S. 287 and County Line Road. The male juvenile driver, a male juvenile passenger and a juvenile female passenger were placed under arrest. They were transported to the Wichita County Juvenile Detention Center and were charged with Unlawful Interception, Use, or Disclosure of Wire, Oral or Electronic Communications and Theft over $2,500.00 under $30,000.00. The vehicle was found to have been reported stolen out of Albuquerque New Mexico. Several electronic devices connected to skimming devices were located in the vehicle. On Saturday February 23, at approximately 11:08 am, Deputy J.T. Mitchell checked on an occupied vehicle at the intersection of I-44 and AC Road. The 42-year-old male occupant was placed under arrest. He was transported to the Wichita County Detention Center and was charged with Public Intoxication. On Saturday February 23, at approximately 12:56 am, Deputy Roy Biter and Deputy Hunter Deason responded to the 3200 block of West Rathgeber Road in reference to a Check Welfare. On Saturday February 23, at approximately 8:35 pm, Deputy Hunter Deason made a traffic stop at the intersection of Bluebonnet and Seymour Hwy. A 20-year-old male passenger was placed under arrest. He was transported to the Wichita County Detention Center and was charged with Possession of a Controlled Substance PG 1 less than one gram, Possession of a Controlled Substance PG 3 less than twenty eight grams, Possession of a Dangerous Drug and two outstanding warrants for Changing Lanes when unsafe and Expired Motor Vehicle Registration. On Sunday February 24, at approximately 12:56 am, Sergeant Cole McGarry made a traffic stop in the 1700 block of Sheppard Access Road. The 29-year-old female driver was issued a citation for Possession of Drug Paraphernalia. On Sunday February 24, at approximately 12:43 am, Deputy Christopher Bashford made a traffic stop in the 1800 block of Kemp Blvd. The 24-year-old male driver was placed under arrest. He was transported to the Wichita County Detention Center and was charged with Possession of Marijuana under two ounces. On Sunday February 24, at approximately 10:39 pm, Corporal Jeff Penney made a traffic stop on U.S. 287 between Peterson Road and Rifle Range Road. The 23-year-old male driver was issued a citation for Possession of Marijuana under two ounces. On Sunday February 24, at approximately 7:53 pm, Deputy Ivan Galarza made a traffic stop at the intersection of Iowa Park Road and 4th Street. The 28-year-old female driver was placed under arrest. She was transported to the Wichita County Detention Center and was charged with three outstanding warrants for Expired Drivers License, Expired Motor Vehicle Registration and Fail to Maintain Financial Responsibility. On Sunday February 24, at approximately 1:41 am, Deputy Roy Biter and Deputy Hunter McCain made a traffic stop at the intersection of 7th and Holliday. The 28-year-old female driver was placed under arrest. She was transported to Wichita County Detention Center and was charged with Driving While Intoxicated. On Wednesday February 20, at approximately 7:04 pm, a Wichita County Highway Interdiction Deputy made a traffic stop at the intersection of U.S. 287 and Loop 11. The 30-year-old male driver, Ricardo Cabrera, 1-23-89, and a 30-year-old female passenger, Heather L. Vaughn, 4-11-88, were placed under arrest. They were transported to the Wichita County Detention Center and charged with Possession of Marijuana over fifty pounds under two thousand pounds and Possession of a Controlled Substance PG 2 over four grams under four hundred grams. 92.4 pounds of marijuana and 19 grams of a controlled substance were seized. On Monday February 18, at approximately 8:24 pm, Deputy Hunter Deason stopped an individual walking in the 100 block of South Ave. D. The 35-year-old male was placed under arrest. He was transported to the Wichita County Detention Center and was charged with Public Intoxication. On Tuesday February 19, at approximately 3:23 pm, Deputy Ivan Galarza responded to the intersection of I-44 and Bacon Switch Road in reference to an Intoxicated Driver. Upon arrival, a 69-year-old male was placed under arrest. He was transported to the Wichita County Detention Center and was charged with Public Intoxication. On Wednesday February 20, at approximately 7:48 pm, Deputy J.T. Mitchell responded to the 3700 block of Hammon Road in reference to a Burglary of a Habitation. Upon arrival, the Reporting Person reported that an unknown person(s) entered the business and stole four firearms. On Wednesday February 20, at approximately 9:16 am, Deputy Amanda Price responded to the intersection of U.S. 287 and Peterson Road in reference to a Disturbance. Upon arrival, a juvenile female was transported to United Regional Health Care by American Medical Response Ambulance for a medical evaluation. On Wednesday February 20, at approximately 7:04 pm, a Wichita County Highway Interdiction Deputy made a traffic stop at the intersection of U.S. 287 and Loop 11. The 30-year-old male driver and a 30-year-old female passenger were placed under arrest. They were transported to the Wichita County Detention Center and were charged with Possession of Marijuana over fifty pounds under two thousand pounds and Possession of a Controlled Substance PG 2 over four grams under four hundred grams. 92.4 pounds of hydro marijuana and 19 grams of a controlled substance was seized. On February 5, 2019, the Wichita County Sheriff’s Office Criminal Investigation Unit began investigating The City View Independent School District Tax Office after an internal audit revealed several significant discrepancies involving large sums of money missing. 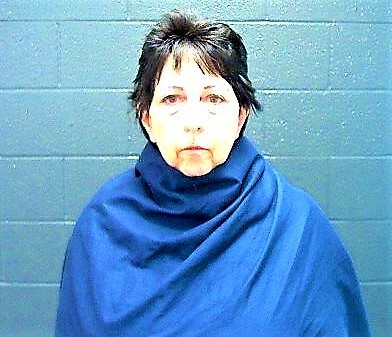 On February 19, 2019, Wichita County Sheriff’s Office Deputies arrested Judith Ann Heaston, white female, 09-30-1955, the former tax collector for the City View ISD. Heaston is being charged with Theft over $300.000.00, a First Degree Felony. On Friday February 15, at approximately 6:25 pm, a Wichita County Highway Interdiction Deputy made a traffic stop at the intersection of U.S. 287 and F.M. 368. 38-year-old male driver, Joshua James Gilbertson, 12-8-80, was placed under arrest. He was transported to the Wichita County Detention Center and charged with Possession of Marijuana over fifty pounds under two thousand pounds and Manufacture/Delivery of a Controlled Substance PG 2 over four hundred grams. One Hundred Thirty Pounds of Marijuana and One Thousand Eight Grams of THC Wax and Oils were seized. On Friday February 15, at approximately 8:05 pm, Deputy Daniel Jacobson made a traffic stop at the intersection of U.S. 287 and Huntington Lane. A Wichita County K-9 detected the odor of narcotics during a free air sniff around the vehicle. The 45-year-old male driver was placed under arrest. He was transported to the Wichita County Detention Center and was charged with Possession of Marijuana over two ounces under four ounces. On Friday February 15, at approximately 6:25 pm, A Wichita County Highway Interdiction Deputy made a traffic stop at the intersection of U.S. 287 and F.M. 368. The 38-year-old male driver was placed under arrest. 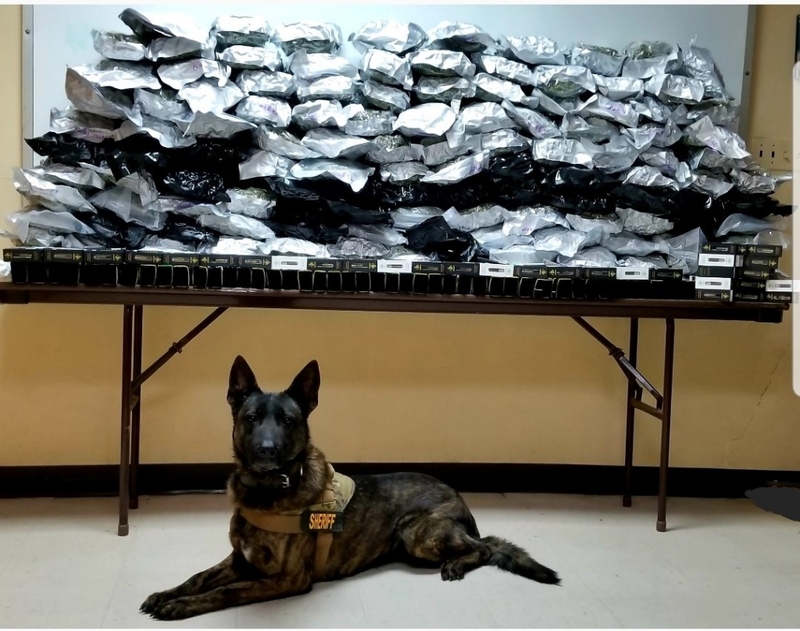 He was transported to the Wichita County Detention Center and was charged with Possession of Marijuana over fifty pounds under two thousand pounds and Manufacture/Delivery of a Controlled Substance PG 2 over four hundred grams . One hundred thirty pounds of marijuana and one thousand eight grams of THC Wad was seized. On Friday February 15, at approximately 4:07 pm, Deputy Eric Jerrols made a traffic stop at the intersection of Seymour Hwy. and Parker Ranch Road. The 19-year-old male driver was placed under arrest. He was transported to the Wichita County Detention Center and was charged with Possession of Marijuana under two ounces and Possession of a Controlled Substance PG 2 over one gram under four grams. On Saturday February 16, at approximately 9:00 am, Deputy Amanda Price made a traffic stop at the intersection of U.S. 287 and Rifle Range Road. The 53-year-old female driver was issued a citation for Possession of Drug Paraphernalia. On Saturday February 16, at approximately 9:10 am, Sergeant Sergio Teruel made a traffic stop at the intersection of Jacksboro Hwy. and Central Frwy. The 40-year-old male driver was placed under arrest. He was transported to the Wichita County Detention Center and was charged with Wrong, Fictitious, Altered or Obscured Insignia. On Saturday February 16, at approximately 10:50 am, Deputy Matthew Schenck made a traffic stop in the 1500 block of Beverly. The 42-year-old female driver and a 35-year-old male passenger were placed under arrest. They were transported to the Wichita County Detention Center. The driver was charged with Possession of a Controlled Substance PG 1 over one gram under four grams and Possession of a Controlled Substance PG 1 under one gram. The passenger was charged with Possession of a Controlled Substance PG 1 over one gram under four grams. On Saturday February 16, at approximately 7:57 pm, Corporal Jeff Lee and Deputy Daniel Jacobson responded to the 8100 block of Bacon Switch Road in reference to a Medical Call. Upon arrival, a 78-year-old female was transported to United Regional Health Care by American Medical Response Ambulance. On Saturday February 16, at approximately 9:40 pm, Deputy Ivan Galarza made a traffic stop at the intersection of U.S. 287 and Hammon Road. The 32-year-old male driver was issued a citation for Possession of Drug Paraphernalia. On Sunday February 17, at approximately 5:50 pm, Deputy Eric Jerrols made a traffic stop at the intersection of Polk and 8th Street. The 45-year-old male driver and a 22-year-old male passenger were placed under arrest. They were transported to the Wichita County Detention Center. The driver was charged with six outstanding warrants for two counts of Capias Pro Fine-No Drivers License in Possession, Capias Pro Fine-Fail to Maintain Financial Responsibility, Capias Pro Fine-Possession of Drug Paraphernalia, Ran Red Light and Occupant over fifteen unsecured by seat belt. The passenger was charged with Theft of a Firearm, Failure to Identify-Fugitive from Justice, and three outstanding warrants for Assault Causing Bodily Injury/Family Violence, Surety Off Bond-Possession of a Controlled Substance PG 1 over one gram under four grams and Bond Revocation-Possession of a Controlled Substance PG 1 over one gram under four grams. On Sunday February 17, at approximately 2:11 am, Deputy Daniel Jacobson made a traffic stop at the intersection of 5th and Travis. The 34-year-old male driver was placed under arrest. He was transported to the Wichita County Detention Center and was charged with Driving While Intoxicated with Previous Conviction. On Sunday February 17, at approximately 12:33 am, Deputy Roy Biter and Deputy Hunter McCain responded to the 2300 block of Jacksboro Hwy. in reference to a Forgery. Upon arrival, the Reporting Person reported that a subject passed a counterfeit $50.00 bill in the business. On Sunday February 17, at approximately 3:56 pm, Deputy J.J. Hernandez made a traffic stop in the 3000 block of Armory Road. The 53-year-old male driver was placed under arrest. He was transported to the Wichita County Detention Center and was charged with Failure to Identify-Giving False Name/Fictitious Information and two outstanding warrants for Expired/No Drivers Licenses in Possession and Failure to Maintain Financial Responsibility. On Sunday February 17, at approximately 7:46 pm, Deputy Ivan Galarza made a traffic stop at the intersection of Central Frwy. and Maurine. The 32-year-old female driver a 27-year-old male passenger and a 45-year-old female passenger were placed under arrest. They were transported to the Wichita County Detention Center. The driver was charged with Possession of Marijuana over four ounces under five pounds and Possession of a Controlled Substance PG 1 over one gram under four grams. The 27-year-old male was charged with Possession of Marijuana over four ounces under five pounds. The 45-year-old male was charged with Possession of Marijuana over four ounces under five pounds and Possession of a Controlled Substance PG 1 over one gram under four grams. On Monday February 18, at approximately 11:33 pm, Deputy Eric Jerrols made a traffic stop in the 4600 block of Taft. The 22-year-old male driver was issued a citation for Possession of Drug Paraphernalia. On Monday February 18, at approximately 11:22 pm, Lieutenant Greg Wilson, Corporal Kristian Valdez and Deputy Brett Brasher responded to the 1500 block of Rifle Range Road in reference to a possible Suicidal Subject. Upon arrival, a 49-year-old male was transported to the North Texas State Hospital for a medical evaluation. On Wednesday February 13, at approximately 5:30 pm, a Wichita County Highway Interdiction Deputy made a traffic stop at the intersection of U.S. 287 and Midway Church Road. The 23-year-old male driver, Javier Munoz Jr., 6-27-95, was placed under arrest. He was transported to the Wichita County Detention Center and charged with Possession of Marijuana over five pounds under fifty pounds and Possession of a Controlled Substance PG 2 over four grams under four hundred grams. On Wednesday February 13, at approximately 1:56 pm, a Wichita County Highway Interdiction Deputy made a traffic stop at the intersection of U.S. 287 and S.H. 25. The 29-year-old male driver, Zaquarius Terell Reese, 5-27-89, was placed under arrest. He was transported to the Wichita County Detention Center and charged with Possession of Marijuana over five pounds under fifty pounds and Unlawful Carry of a Weapon. Seven pounds of marijuana was seized. On Monday February 11, at approximately 5:17 pm, A Wichita County Highway Interdiction Deputy made a traffic stop at the intersection of U.S. 287 and F.M. 2384. A 22-year-old male, a 19-year-old male, a 21-year-old male and another 22-year-old male were placed under arrest. They were transported to the Wichita County Detention Center. The 22-year-old male was charged with Manufacture/Delivery of a Controlled Substance PG 2 over four grams under four hundred grams, Money Laundering over $2,500.00 under $30,000.00 and Possession of Marijuana under two ounces. The other three males were charged with Manufacturing/Delivery of a Controlled Substance PG 2 over four grams under four hundred grams and Possession of Marijuana under two ounces. On Tuesday February 12, at approximately 1:00 pm, Deputy Amanda Price responded to the 2700 block of F.M. 369 South in reference to a Theft. Upon arrival, the Reporting Person reported that four subjects entered the property and stole a stock trailer, a flatbed trailer and a four wheeler. On Wednesday February 13, at approximately 11:02 am, Deputy J.T. Mitchell responded to the 1200 block of Lentz Road in reference to a Theft. Upon arrival, the Reporting Person reported that several tools were taken from a shop at the residence. On Wednesday February 13, at approximately 1:56 pm, a Wichita County Highway Interdiction Deputy made a traffic stop at the intersection of U.S. 287 and S.H. 25. The 29-year-old male driver was placed under arrest. He was transported to the Wichita County Detention Center and was charged with Possession of Marijuana over five pounds under fifty pounds and Unlawful Carry of a Weapon. Seven pounds of marijuana was seized. On Wednesday February 13, at approximately 5:30 pm, a Wichita County Highway Interdiction Deputy made a traffic stop at the intersection of U.S. 287 and Midway Church Road. The 23-year-old male driver was placed under arrest. He was transported to the Wichita County Detention Center and was charged with Possession of Marijuana over five pounds under fifty pounds and Possession of a Controlled Substance PG 2 over four grams under four hundred grams.